The hotel is a few steps away from the Porto Frailis Bay and is situated in one of the most beautiful area of Sardinia, close to the marvellous “Golfo Di Orosei” coves, the Gennargentu natural reserve, the Ulassai caves and numerous archeological sites. The building is 5 minutes from both the port and the airport of Arbatax. The hotel is a modern building, furnished in a traditional style which uses the natural shades of earth combined with Sardinian stones. There are 24 wooden-beamed bedrooms with en-suite marble bathrooms. The furniture is classic and elegant with all modern facilities at hand: radio, television, air conditioning, free wifi internet, mini-bar and safe. The “Vecchio Mulino” Hotel is proud of its breakfasts and guests are offered delicious home-made cakes and pastries. There is always a wide choice of fresh fruit and other natural food products. Opening season: 01 January - 21 December. 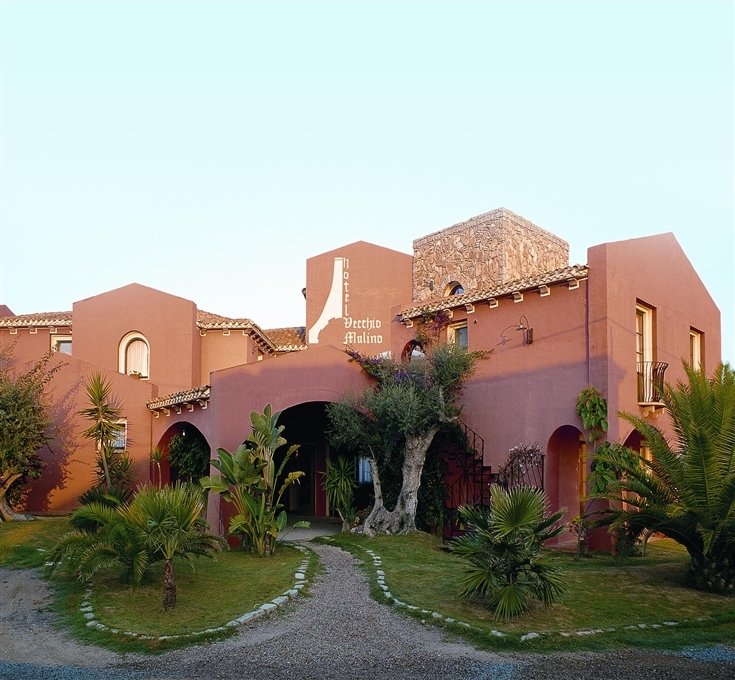 The Hotel Vecchio Mulino is located in Arbatax, a hamlet of the municipality of Tortolì, on the east coast of Sardinia. This area is world famous for its stunning beaches and for its beautiful unspoilt nature. Reaching the house is not very difficult but it is necessary to drive some hours on the SS125. This road, famous for the breath-taking sceneries it offers during the journey, goes through the whole eastern coast of Sardinia. From Cagliari (northbound to Muravera – Tortolì), it will take about 2 hours to reach your destination, while from Olbia (southbound to Nuoro – Tortolì), it will take almost 3 hours. - Children from 0 to 2 years: free of charge sharing the bed with parents. Baby cot: Euro 10,00 per day, to settle on property. This property requires minimum stays of 2 nights from 01/05 to 30/06 and from 25/08 to 30/09, of 3 nights from 01/07 to 20/07, of 4 nights from 21/07 to 09/08, and of 7 nights from 10/08 to 24/08. - Half Board (drinks included): Euro 25,00 per person per day.